QuietFan™ Fan Speed Control - Micro-Air, Inc.
QuietFan™ is a very unique, original design from Micro-Air that uses sophisticated PWM control to drive an AC fan motor with variable speed. It is not a frequency drive. The result is a much quieter fan motor at low and medium speeds, which is critical to cabin comfort and easy sleep in today's luxury yachts. QuietFan's acoustical performance is amazing. 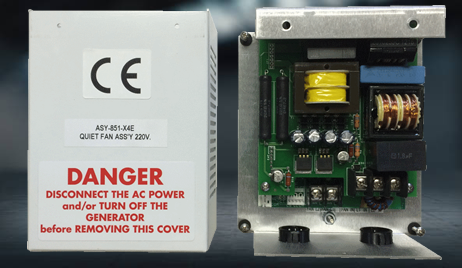 As compared to a fan motor driven by a standard triac circuit, QuietFan delivers up to 6dBA noise reduction (@1m). Also, QuietFan has been measured to deliver up to 1dBA noise reduction as compared to the much more expensive DC blowers, sold often in the marine HVAC industry. QuietFan installs easily as a retrofit or into a new installation. It is wired in directly inline between the cabin control and the fan, using the same triac output signal from the cabin control to determine the speed setting at which to drive the fan motor. This makes QuietFan a quick problem-solver for a cabin blower that is noisy at low speed. Setup is even easier as QuietFan has no other adjustments; the same fan speed programming in the cabin control is used to adjust the desired fan speed output.